And Relative Pitch In Less Than 6 Weeks!" On This Revolutionary Approach To Mastering Pitch Forever!" Did you know that for centuries the world's greatest musicians and composers have had a secret weapon that few others knew about? And even more astounding is the fact that every single person has this same ability lying undiscovered inside! Most professionals agree that a good sense of pitch is one of the most important qualities of good musicianship. Below are various quotes acknowledging some of the top musical performers' absolute / perfect pitch abilities. "Although Hendrix never learned to read written music, early in his career as a sideman he could learn a new band's entire repertoire in an hour or two by just hearing the songs once. Again, this would be beyond someone without perfect pitch." "He talks about his Julliard years and says how he and his friend used to call out the pitch as soon as a sound was heard." "Luckily, she discovered the art of singing and had a natural talent for it. Having perfect pitch she could sing back exactly what she heard at the age of four." "The interviewer began to randomly play pitches at the keyboard and Yanni, without hesitation, accurately identified every one of them." 1. 10% of students at the leading music schools, including Julliard School of Music, have absolute pitch. 2. A symphony orchestra usually includes 20% - 40% of musicians with absolute pitch. 3. Numerous leading surveys have concluded that at least 50% of today's top recording artists have either absolute pitch, relative pitch, or both! Even today there are some universities around the world that teach their students that absolute pitch can't be learned. You're either born with it or not. Personally, I know this to be a completely false statement considering I learned this skill in my teens. So what exactly is absolute pitch (also known as perfect pitch)? It is the ability to hear a musical note or chord and name it. I predict that in the future universities will start to wake up to the fact that this is a skill that can be taught, just like language and art. Until then there will always be people that don't try to understand it. Instead they simply dismiss it as a genetic defect. I guess the saying "People criticize what they don't understand", applies to absolute pitch. To me I can't help but laugh at all this nonsense. And hopefully since you're reading this then you also know that absolute pitch is a skill that can be learned. That brings me to relative pitch. So what is that? Simply put, it is the ability to hear and comprehend the relationship between one note and another. In other words, a musical interval. For example, a perfect 5th is an interval. Now here is the funny thing, relative pitch is usually taught in universities... So at least they got something right! I recently read an article about a scientific study done to try and determine why some people have absolute pitch while others don't. And you know what they said at the end of the article? They theorize there might be a absolute pitch gene! I remember laughing my head off at that... What a load of BS. That's like saying there is a special singing gene, or a guitar gene that only guitar players possess. Ah, so that explains why some people are singers and some aren't... Yeah right! When I was born I didn't know what the note C sounded like. I had no concept of music. And neither does any newborn baby. It is a learned skill, just like language. I was 16 when I learned this skill, so that is very strong proof that there is no special gene. absolute pitch can be taught to anyone regardless of their genetics or age. I have even taught this method to musicians who are in their 50s and 60s! It is simply a skill like any other. There is no such thing as a natural, only a student. "They say you can't teach an old dog new tricks, but I'm here to tell you that you certainly can!" My journey to mastering both absolute pitch and relative pitch began when I was 16 years old. At the time I was learning guitar and really wanted to step up my musical skills. I decided to ask my music teacher about absolute pitch and she told me that if you don't already have it you can't learn it. I remember my determination at the time thinking, 'I'll show her that I can learn absolute pitch'. Since then I have maintained my skill and every now and then I'll test myself for fun. I always score 100%! It's as easy as spelling my name. Over the years I have talked to literally hundreds of musicians through email and direct contact on the issue of absolute pitch and relative pitch. Many of these musicians had actually tried to learn absolute pitch through various courses on the market, but most of them failed to see any improvement. As for relative pitch, it seemed that many more were able to learn this particular skill by simply learning their instrument, but only after years of practice. So I decided to research all the courses that taught these skills and I discovered that they were very abstract in their approach. They seemed very confusing and I could instantly understand why so many musicians were struggling to improve. You have to understand that at this point I HAD absolute pitch, and these courses taught in a way that was very counter-intuitive. Completely different then the method I had used to learn these skills. I knew at that point that the method I had devised as a teenager to master both these skills of pitch recognition would be so much faster and easier for people to learn then the more cumbersome methods out there. "My motto has always been that if you want to learn a skill then find a teacher who is a master of that skill, and not someone who can talk the talk but can't walk the walk!" If you've ever previously tried to learn absolute pitch from other courses, then the Pure Pitch Method will seem to make much more sense in your logical mind. That's because this approach is very logical and not at all like other methods on the market. This method is quick and won't take years to master, in fact you will see results after the first lesson. The Pure Pitch Method of learning is all about building momentum. Who wants to learn a skill and not see any progress? How do you know if you're actually learning? This is the main problem with other absolute pitch courses, they tend to teach that after six months of going over listening exercises that one day you'll wake up and realize you have absolute pitch! That's insane! Instead it needs to be a gradual progression of learning, all the while you are seeing and hearing constant improvement... Just like any other skill. Look around at other courses and you'll discover that they fail to teach both relative and absolute pitch simultanously. I want to make this perfectly clear... You will have an extremely hard time mastering absolute pitch if you have no previous relative pitch training! The reason for this is simple; a person who understands relative pitch is already very familiar with musical notes in general. This makes mastering absolute pitch a whole lot easier! That of course doesn't mean it's impossible to learn absolute pitch on its own, it will just take a very long time! The Pure Pitch Method uses an innovative approach to ear training. It works by using powerful exercises which train both relative and absolute pitch at the same time. And by employing a revolutionary method called audiation the student is able to start hearing notes in their mind and connecting them to note names. "These are the same exercises I developed as a teenager to teach myself how to master pitch recognition in less then 6 weeks!" They work by building up your inner ear. It is basically like you're learning how to visualize sounds in your mind. Trust me, it sounds a lot harder then it is. In fact this method of learning is so powerful that within the first lesson many students have already embedded their primary anchor note and can begin to name a number of notes just by hearing them played back. One word... Genius!! Your method of ear training totally works! When I first read your sales page I was a little skeptical, probably because I had tried another famous absolute pitch course and saw zero results. I started to believe that I was just tone deaf or something. Anyway, so as I started listening to your course I instantly realized that this was going to be very different. At the end of the first day I was so excited I finally understood the theory behind how to do it! Since that first day I have seen significant improvement, it makes me feel like I have a superpower, it's very cool! This is the best investment for my music career so far. I love what you have done for me. Keep it up! As a student majoring in music I really wanted to learn more about absolute pitch. Out of all the courses I looked at, pure pitch seemed like the best value for money. It didn't take me long to realize that I made the right choice. All the lessons were very easy to follow and provided tons of great exercises. After witnessing my own improvements, I have been recommending the course to all my classmates. I've been singing for the last 15 years but I always required the use of a reference note from an instrument in order to get my musical bearings. That has all changed since listening to your pure pitch method. Now I can instantly name any note or chord just by hearing it. I can even tell whether a pitch is in tune or not. My band has started calling me 'The Human Tuner'! ... After the first lesson I could hear the notes so much clearer. It was like a lightbulb turned on in my head. At the moment I'm up to lesson four and can already name many notes by ear alone. I just wanted to contact you and say thanks for creating this amazing course! Since starting less than a month ago, I can already name every note and chord I hear in a split second. This is an amazing feeling, and I owe it all to pure pitch. Pure Pitch has allowed me to achieve my goals quicker then I could've imagined. I really wanted to learn to solo over chord progressions using my ears alone. Now I can hear a chord and know exactly what notes will work over it. This has given me a new way to create unique melodies that sound like nothing else. Having this skill has totally changed the way I approach music. I can honestly say that without pure pitch I would never have attained this ability. It is truly a blessing! ... Already I have seen the benefits of my absolute pitch ability. I got a call from a local band that were seeking a bass player, so they sent over a demo of their songs. After just 30 minutes I had worked out each of the songs note for note simply using my ears. Long story short... I got the gig! Over the last 2 months I have gradually built up my pitch recognition using pure pitch. The thing I love about the course is that you can go at your own pace, and take all the time you need to fully understand each note relationship. I have even started having dreams where I hear the most beautiful melodies and can now work them out on the piano as soon as I wake up. It has become an addiction! ... I think the hardest part of singing for me was staying on pitch. Now I can sing any note and feel the exact way it should sound. I do all warmups without once needing the piano to accompany me. This was out of the question before I started using the pure pitch method. Last week in music class our teacher was discussing absolute pitch so I thought it would be a rad idea to freak him out with my skills. I raised my hand and declaired that I had absolute pitch. The class looked over at me with disbelief, and I could tell that Mr. Murray was also skeptical. I said "play any note on the piano and I'll name it!" He walked over to the piano and played a G above middle C. I called it out and his face went pale! Finally he said, "correct!" The class let out a "WHOA!" He tried another note but I got it right again! Since then everyone in my class has been begging me to tell them how to do it.... I won't tell them! Thanks for making me a musical anomaly! The true power of this method is the speed at which you can start using these innovative pitch recognition techniques. Think about this for a minute; who wants to spend months or even years learning from other pitch recognition courses than fail to see any results? Instead why not join the thousands of other musicians who use the Pure Pitch Method and see results from day one! The Pure Pitch Method is so effective that you will start naming notes by ear within the first lesson! This is unheard of for every other absolute pitch course ever created, and is the reason why the Pure Pitch Method is seen by many as the best in the world. It is the fastest and easiest approach available anywhere! 1. You hear a note played. 2. Using your embedded Primary Anchor Note as a reference you instantly work out where that particular note sits in the chromatic scale. 3. You call out the note by name. This of course is only the beginning. As you master your Primary Anchor Note you can begin the process again by embedding your Secondary Anchor Note, and so on, until all notes have been embedded. The Pure Pitch Method includes 39 daily lessons which encompass exercises designed to strengthen your inner ear and enable you to master the art of absolute pitch and relative pitch with ease! Not only will you learn how to identify any note by name, but also any interval, or common chord! What is also great about this course is that you don't need to know how to read music or any music theory. All the essentials are explained within the course! After you start using the Pure Pitch Method you will see a whole new world of musical possibilities open up to you. Not only that but you will be seen by others around you as exceptional and rare. Who doesn't want to feel that boost of confidence? Below is a list of just some of the awesome things awaiting you. Learn How To Name Any Note Or Chord By EAR! Sing Any Note From Memory Without Using A Pitch Pipe! Compose Songs And Melodies In Your Head With Ease! Find Any Chord By Ear, Instead Of Searching With Your Eyes Or Fingers! Know The Key Signature Of Any Song By EAR! Identify Whether A Pitch Is Sharp Or Flat By Ear! Hear Sheet Music Mentally As You Read It! Improvise With Confidence, Knowing You Can't Mess Up! Increase Your Appreciation Of Music! SPECIAL OFFER - Only Available For A Limited Time! Due to the sheer value of this information I can only sell a limited amount of copies at this special reduced price, after which I will be raising the price substantially! So for the next few days the Pure Pitch course can be yours for just $97.00! Now if you've followed along so far then you know this price is peanuts compared to the opportunities that will present themselves to a musician with absolute pitch recognition. In fact after this auction ends I will probably raise the price substantially and of course people will pay for it because it is worth a lot more. I want you to be at complete ease when making this life changing decision, because I know that if you follow through the Pure Pitch Method you will develop absolute pitch and relative pitch in no time at all. So with that in mind I have decided to offer you an unbelievable 2 MONTH 100% MONEY BACK GUARANTEE! So if you believe that you did not benefit from the techniques employed in the Pure Pitch course, then all you have to do is email me for a full refund! I will promptly return your money no questions asked! Many people have asked why I offer such an amazing guarantee, and my answer is simple... I know, without question, that the information you will learn is going to totally transform the way you hear music, that I have no concerns whatsoever about people asking for a refund. In recent years the internet has allowed sellers to share products with customers by offering direct downloads. This new innovation in product delivery cuts out the cost of manufacturing and shipping, with the saving passed onto you. 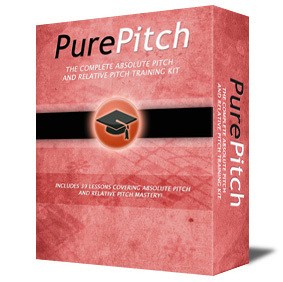 Therefore, once your payment is processed you will be able to download the Pure Pitch course immediately! No waiting a week or more for a package to arrive in the mail... Instead you can begin taking advantage of this revolutionary method of pitch recognition right away! Special Purchase Price ONLY $97.00! This reduced price sale will be finished soon. Order now and take advantage of this incredible offer! I am extremely excited about hearing how the Pure Pitch Method has impacted your musical abilities. And remember if you have any questions all you have to do is email me! P.S. 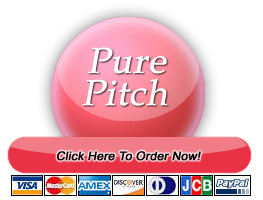 Remember the Pure Pitch course is offered at a special price of just $97.00 for a limited time only. I will be raising the price in the very near future. Therefore, if you are truly interested in unlocking your latent musical potential I suggest you take advantage of this incredible offer while it lasts. This special offer may not be repeated again. So if you miss out there is nothing more I can do.